The Metropolitan Transporta­tion Authority board of directors is proposing a task force to investigate ways of improving transit links to the planned NFL stadium in Inglewood and encouraging football fans to take mass transit when the Rams begin playing in the Southland. The Rams will begin playing this fall at Los Angeles Memorial Coliseum while a new stadium is built at the former Hollywood Park racetrack site in Inglewood. That facility is expected to be ready in time for the 2019 National Football League season. 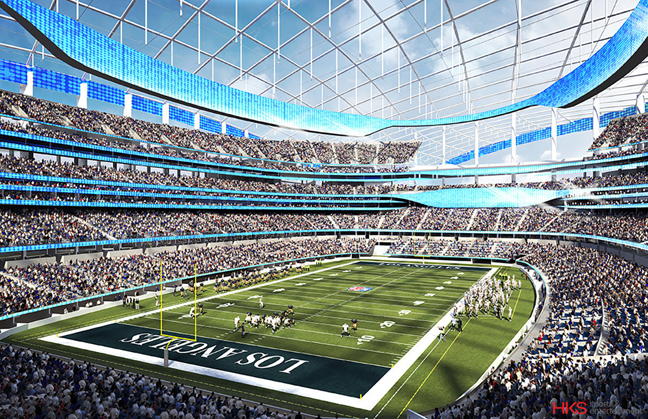 The new stadium will house the Rams, and potentially either the Chargers or Raiders. A Metro board staff reports notes that the Coliseum is adjacent to the Metro Expo Line's USC station. The under-construction Crenshaw/LAX Line, which will connect the Expo Line with the Green Line near LAX, is expected to open in 2019 and include a downtown Inglewood station that "will be located within a few minutes' walk from the new stadium," according to the report. “Ensuring the success of this highly anticipated regional asset will require strategic action and a concerted partnership with Metro, as facilitating the transport of tens of thousands of spectators for games and other events will require significant synergy with our growing transportation system,” according to the board report. • exploring joint-development opportunities in surrounding areas. The Crenshaw/LAX Line’s Inglewood station will be located near Florence and La Brea avenues, roughly 1.5 miles from the stadium site.